Learn how to use Training Load, Muscle Contribution and Balance to quantify how your athletes are responding to your programming. 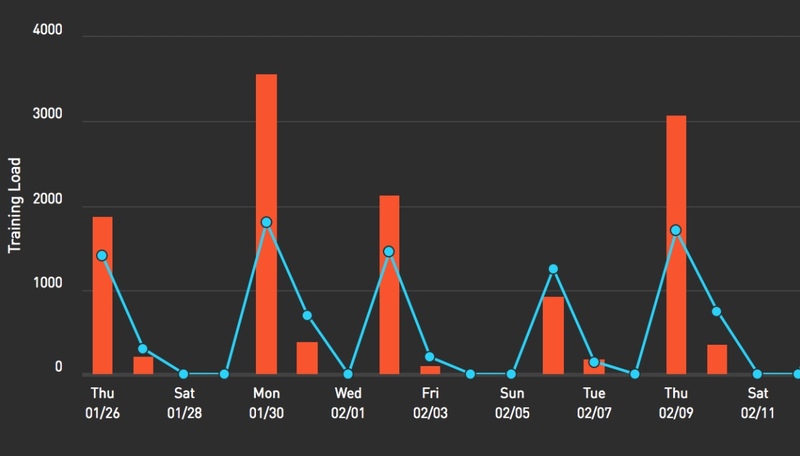 Once you have selected an athlete of interest from your Athlete feed you can visualize their program performance here. 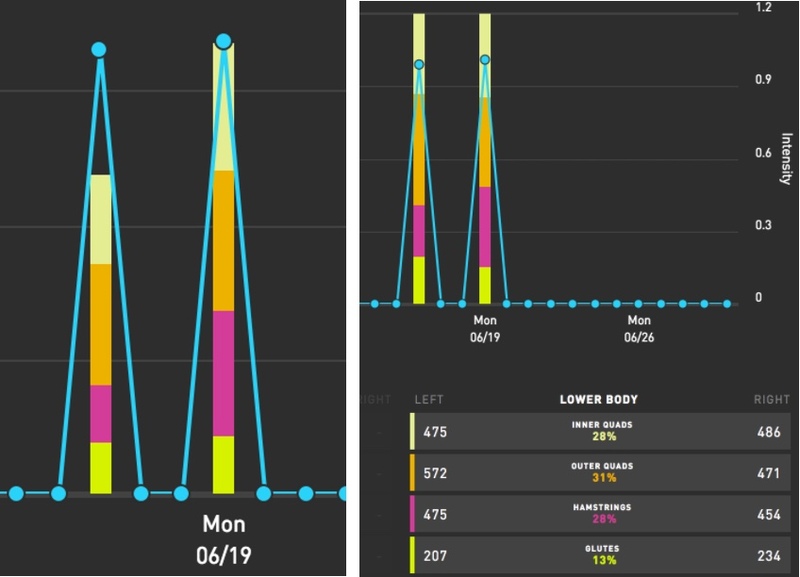 Quantify how your athlete has been stressed and rested throughout their Return to Play program across all sessions: Rehab, Strength, Field Work. Is the total training load trending as intended within the week and as they get closer to Return to Play? Look for consistency, variation, or linear progression based on your goals. As volume is added, Training Load can stay the same or decrease as the muscle becomes stronger and better recruited during movement. Tip: To prevent overtraining re-injury, Training Load should not increase by over 10% between days or weeks. Verify that as you progress your athlete through their program and back into group training, that the muscle of interest is contributing as intended to each session. Note: Toggle muscles on/off to isolate muscle group of interest. As training load increases with similar sessions, do the contributions change? Is the change likely reducing the potential of re-injury with the increased load? On 6/19, volume was progressed during a glute-centric ACL recovery program. The hamstring contributed (pink) more to the session with the change in load, instead of the glute. To directly compare the contributions on 6/18 and 6/19, the graph was normalized (training load differences cannot be observed here). Hamstring contribution jumped from 18% to 28%. Verify that as you progress your athlete through their program and back into group training, that their left/right balance does not vary unexpectedly with changes in training load. Note: Toggle muscles on/off to visualize the left/right stress on muscle group of interest. 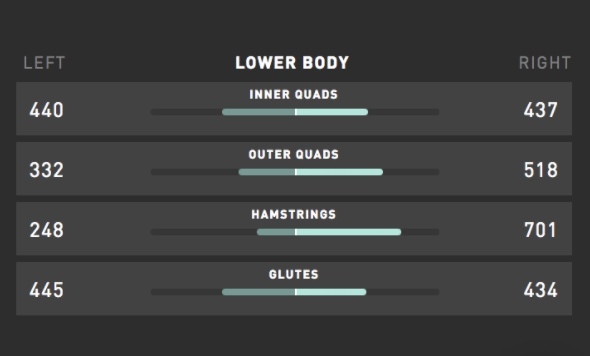 Review the athlete’s balance to monitor proper recruitment of the healthy and injured side. If the imbalance shifts by over 20% towards the injured side with an increase in training load, this can be a sign of overuse. If the imbalance shifts over 20% towards the healthy side with an increase in training load, this can be a sign of compensation. Modifying the program might be critical to avoid re-injury. On light training load days, 2/2 and 2/15, the athlete’s left/right training load are more balanced than days of high training load, 2/9 2/13 and 2/16. On Thursday’s practice, 2/9, the overall training load increased and the healthy hamstring, right, worked 64% more than the left.